New, Quicker Charger for 18V Batteries??? I have a couple of 18V tools at the moment, with a total of 3 batteries (2x 4.2Ah, and 1x 3Ah). If I get enough in the tool budget, I'm planning on buying more cordless tools (TSC 55 and BHC 18, plus I suspect there'll be more 18v tools coming later this year). with Li-Ion developing as it is, and brushless motors, I think cordless is the future. The current charger (TCL3) takes well over an hour to charge an empty 4.2Ah battery. I haven't timed it but it does seem slow - maybe even slower than the older, slightly larger charger? It's that bad sometimes that I end up not fully charging them, because I don't have time to wait. With the cordless Carvex working hard, it's quite easy to empty 2 full batteries before the 3rd has charged (exacerbated by the fact that when you do work them hard, the batteries have to cool down before you can charge them!). With the new 5.2Ah batteries, it's going to take around 20% longer again. How about a quicker charger? It's great having larger capacity batteries, as it means they'll need charging less often. But if it takes an age to charge them it's going to get old very quickly. I think the 'reasonable limit' on charging time is around 40-45 minutes - I don't think given the competition that over an hour is acceptable (the new Makita 5.0Ah batteries charge inside 45 minutes). If they can do it, I'm sure Festool can. In fact, while were on the subject, make it a 'double' charger for charging 2 batteries at once. That's definitely needed for the TSC anyway, shipping it with 2x single chargers was a bit of a cop-out. I'm not too bothered about the physical size either, make it a bit bigger if it helps. Even if it needs it's own systainer. Heck, maybe even built in to a systainer? Plus a fan for cooling, if that helps. It doesn't even need to replace the existing charger - the tools could be shipped with the TCL3, with the 'rapid charging station' as an extra. So, a rapid charging station, to charge 2 batteries in under 45 minutes (5.2Ah). How hard can it be? Re: New, Quicker Charger for 18V Batteries??? The quickest of quick chargers are aircooled as you noted, but there are air channels in the battery pack to allow for the air to flow through the pack, not just around it. Makita was first on this a while back, and Metabo has adopted this as well. However Makita will "only" push them at 5A while Metabo will bring it up to 6.5A peak, and lower the amperage as it nears full capacity. 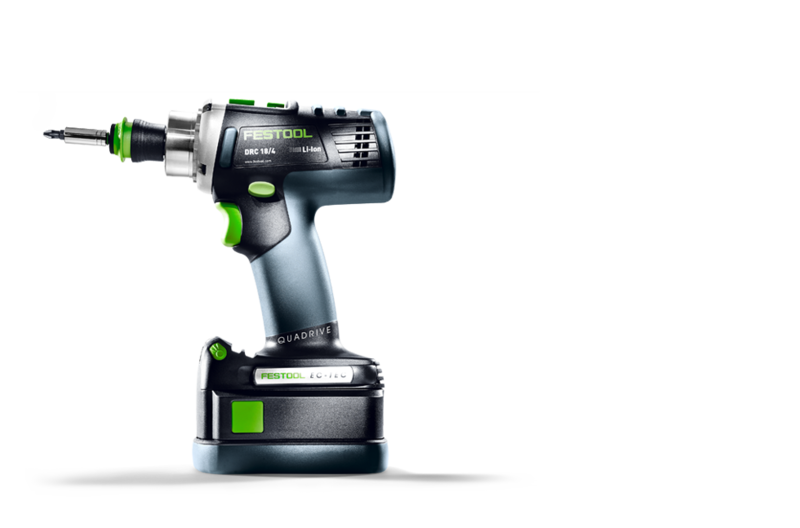 It would most likely require a new battery platform to get there for Festool to get on that level, I'm not sure any of you would want that. Bosch just recently introduced their "coolpack", which doesn't have internal cooling channels, but has a "super heat conductive polymer" on the bottom. It takes 45 minutes to get to 4Ah to full, despite pushing 1A higher than the Makita (which means they spend not nearly as much time at full amperage). So I guess not bad. Maybe Festool should license the super conductive polymer idea from Bosch. To be fair, we don't know how long any of these charge cycles are affecting battery longevity. Tesla (or was it Nissan) said that when quick chargers were used, it would cut battery life by HALF. According to Makita UK, the standard charger over here (DC18RC) will charge a 4Ah in 36 minutes, and 5Ah in 45 minutes. Also, remember we're not talking NiCad's here: you don't need to charge them to the max- partial charge won't cause any harm. The current charger (TCL3) takes well over an hour to charge an empty 4.2Ah battery. The TCL 3 can charge a 4.2Ah battery in 70 minutes. The 5.2Ah batteries will take 90 minutes, although they reach 80% charge at 70 minutes. 90 minutes is fine, I'll put one on to charge over lunch!! If you have 30min t break at 10 and 3 as well, can I come and work for you? ? Yep 70mins to charge the 4.2 bats, that's why when using the TSC 55 you need a min of at least 4 bats and that's just dedicated to the saw, so if your using a drill and maybe a Carvex or something else, that's six bats on the go and two chargers working away. I'm impressed with the TSC but you have only got to think of making a cut and the battery level goes down one. Yep bring on faster chargers. An important thing to keep in mind regarding charge times is that higher charge rates, i.e. faster charge times, reduces the number of charge cycles a battery can withstand. Personally I'll deal with the longer charging times if it means my battery lasts longer before having to replace it. +1 for double battery charger. Maybe they could integrate this feature into a Festool jobsite radio! What high drain tools are you guys using that need you to be hot swapping batteries so quickly, Festool doesn't make any real tools like grinders and such that are the real battery killers? Pretty sure my drill battery goes a week before I have to swap. TSC 55 is probably the biggest battery killer that Festool make, eats two batteries pretty quickly if the stock your cutting is quite thick. I can easily get through four batteries in one day and that's just with the TSC in use, throw in a Carvex and that will eat another battery. Yesterday I charged three Makita 3ah batteries quicker than it took for one Festool 4.2ah battery to charge. So yes faster double battery chargers are definitely needed now the bigger draw tools are out there. Doh. Forgot about the TSC/HKC. That makes sense. so maby this is a fast charger for Festool batteries? (or/and new type of batteries like makitas whit airintake for the charger? Quadrive is the family name for the heavy drills DRC and PDC. It refers to the 4 speed gearbox they both have. It's also printed on the side of the drill (some of them). It dates from the time both of these drills were sold under the Protool brand from around 2009. The saws seem to be the machines that will run your batteries flat faster than you can charge up a pair - and you would need TWO chargers too! Despite that I am not too sure on super fast charging of batteries - seems that it would shorten the life span and/or make them less potent pretty quick. They would probably have a faster cut off time (in percentage of capacity drain before safety cut off) to enable fast charging. There aren't too many free lunches in the battery world. I think the synergy between "efficient" machine construction (thinner blade, single battery, as with the HKC55) and stretching the battery technology is the best marriage for high drainage battery machines. For that reason I am not too impressed with the dual battery solutions. I do think they do their job on site though. From what I've been told/read of the lithium manganese cobalt cells (and most lithium cells in general), the greater enemy actually isn't the charge/discharge rate itself, but the heat associated with high amperage inputs/outputs that causes the cell the break down (80 C/176 F being the absolute limit the cells should reach). Tesla's new P85D has a mode that allows it to dump huge amount of amperage for a short period of time, something equivalent to ~800 hp, and the challenge there was not the cells themselves, but optimizing the liquid cooling for the cells. With carefully ramped and monitored charging, it's possible to turbocharge the beginning of the charge cycle without adding a bunch of heat, and taper the amperage as the cells get more full. Add active cooling as Makita and Metabo have, and you can push even higher amperages without cell degradation. Watched a video yesterday about a Bosch Professional cordless electric lawnmower. It uses 2x 36V, 6Ah batteries, and they charge, from empty, in 20 minutes. The 36V Stihl gear comes with a choice of 3 chargers (with three corresponding costs!). I got the faster of the 3 and it charges the batteries a lot faster than I can use them up! I think the cordless gardening market is going to seriously push battery and charger tech along .. a lot of the current cordless tool manufacturers have got a bit lazy IMO. I am not that worried about fast discharge but I am not that confident in very fast "forced" charging of batteries. It will generate heat and even if tapered down towards the end heat is the enemy for long term stability. I think. Yes, but when they are "empty" I am sure they still have a lot of juice left in them. Seems they have a limiter / cut off with room to spare to allow for fast charging. Bosch are touting the "Cool Pack" with more air and more air flow to compensate for high heat when charging. Bosch own literature states that batteries will wear out fast when stored or exposed to temperatures higher than 50 degrees (Celsius) if I remember right. Charging batteries outside on a hot summers day building a deck comes to mind as a high drainage and forced charging situation. In the next few months I am not worried, I can throw the batteries in a pile of snow and force charge it in five minutes and keep the pack Cool. 90 mins, your obviously not self employed or on price work. Give it up 45 should be max, just bought the TSC55, did less than 20 mtr flat two batteries. (MDF 18mm). I hope that the tool will bed in and get better life. Ironically, given that Lithium batteries are an "upgrade" over previous battery systems, the older NiCd batteries could usually be charged in 15-20 minutes, or sometimes less, with high amperage "Ultra-Rapid" chargers, and the batteries supposedly would last thru 2 to 3 times as many charging cycles over using regular "1 hour" chargers. I think charge times have increased due to higher Ah batteries taking more time to charge. But Festool has introduced Airstream that should considerably reduce charge times. Maybe our resident EE @Rick Christopherson can give us some insite on all this voltage amperage temperature timing stuff ? Well there's your first clue. Lithium batteries are an upgrade only as it pertains to the weight of the battery, but NiCd and NiMH actually have higher amperage densities. Each new technology is in high demand only because some marketing department (many companies) convinces people they need it. It's not unique to just batteries. Most industries are this way. I've been saying for decades that the sanders you all own are not the best for the purpose, but are simply what marketing had driven. Actually, to answer your question, yes, different battery technologies require different charging profiles. That's the reason why intelligent chargers utilize microprocessor control. It is no longer just a matter of giving a battery a voltage above discharge in order to charge. Each battery chemistry requires a specific charging profile as it passes from dead, half dead, half charged, to charged. Depending on the battery type, some charging phases are based on voltage, then the next phase is based on a specific amount of amperage injection, and so on, until that particular battery type reaches full charge. It is no longer just giving it juice until the battery is charged.